Free of charge cancellation for groups is possible 7 day prior to arrival. By late cancellation or in case of no show we will invoice the guests with the whole booking amount. 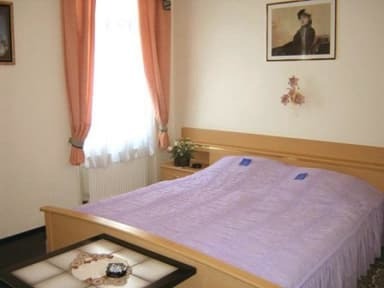 The 1*Hotel Garni Djaran is a traditional town hotel located opposite the train station in Offenbach am Main, eight kilometres from the centre of Frankfurt. The 21 guestrooms have a simple light decor, and all include cable television, mini refrigerators,hair dryers, W-Lan Internet access. Before a day sightseeing, guests can enjoy the buffet breakfast service, and if they have any queries the front desk is open 24-hours a day. 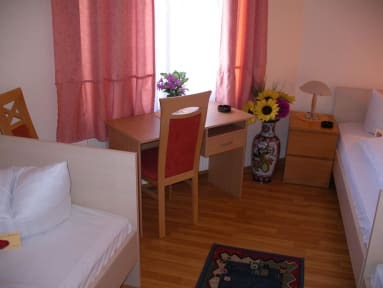 Guests are 300 meters from Offenbach shopping centre, or they can leave their car at the hotel and catch the train to Frankfurt (6 kilometres away), which takes you into the city centre in 12 minutes. Frankfurt airport is 15 kilometres away.